This is indeed some heavy hip'n'clap dancefloor rhythm'n'blues, on a though-sounding 45 pressing, smelling kinda like The Herbaliser Blues Brothers Band doing its own James Bond thang... Gimme some more! The Broken Keys is a new studio project from Ben Lamdin & Nathaniel Pearn, better known as Nostalgia 77 and Natural Self. The two producers are old friends and between them they have produced a string of successful independent releases in recent years. The forthcoming The Broken Keys LP 'Gravity' is their first full length collaboration and in this latest incarnation they've really hit on something new. 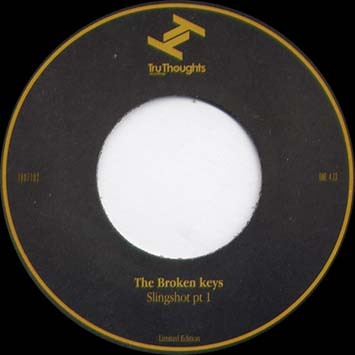 'Slingshots' is Tru Thoughts first The Broken Keys release on a 7" and is best described as a straight-up dancefloor destroyer. Dom Servini (Straight No Chaser has already praised its "insitent drums and bold brass", saying he "can't wait" to hear the whole album. 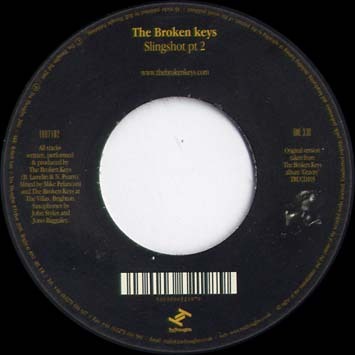 While 'Slingshot' represents the funkier side of The Broken Keys' sound, their LP boasts a broad range of musical styles - from the unique B-Boy Ballad of 'Redlight', through the solid dancefloor grooves of 'Burnt Popcorn' to the voodoo-child preacher funk of 'Razorblade' and 'The Witch'. The LP benefits from a hugely authentic sound, achieved by combining the best vintage studio equipment with the modern techniques and the ubiquitous sound of the sampler. It's everything you miss about the old discs, but with the excitement of a modern recording. The Broken Keys combine what we love best about the great funk, soul and classic rock LPs of the 60s & 70s with the hard-hitting hip hop records of today. Try to imagine what the Gorillaz would sound like if they went x-rated, or dream up a wild combination of MF Doom, Edan, James Brown & Jimi Hendrix and you might be getting close.